ClubSport San Ramon offers swimming and other aquatics programs for children and adults of all ages, swim skill levels, and interests -- from beginner to advanced. Located in San Ramon, CA, we have 2 outdoor heated pools, including our newly remodeled lap pool and a junior pool perfect for youth swimming lessons. Spring & Summer 2019 Registration is Open! Swim Team: Join the 2019 CSSR Marlins Today! Jumpstart your child's swim team success! Parent/Tot (6mo-3yrs) classes to swim classes for 3-12 year olds. All levels, beginner to advanced. All levels. Individualized instruction, even in Group Classes. Triathletes: Ask about personalized triathlon training with Coach Kim Leslie to up your swimming technique and improve you time! 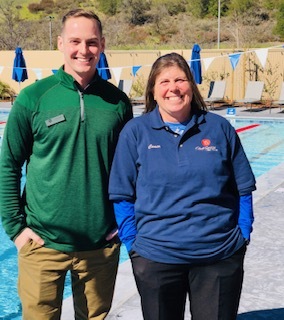 ClubSport San Ramon Aquatics Manager, Chris Rodinsky, has over 11 years of swim coaching experience, and over 20 years' experience as a competitive swimmer. Marlins Head Coach, Kim Leslie, has 40+ years of Aquatics experience and has 30+ years of coaching background. Coach Kim, who competed in butterfly in college, swam both competitively for USA Swimming and Rec Leagues across the Bay Area.